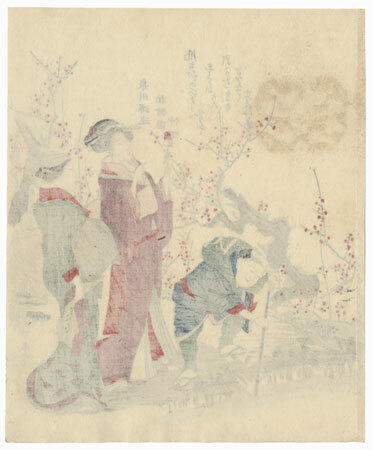 Surimono - Surimono are an exclusive subcategory of Japanese woodblock prints. Poetry clubs commissioned these designs for distribution to a small audience of members, most often as New Year's greetings. These privately published images included a wonderful range of subjects and lavish printing techniques such as embossing, burnishing, and metallic pigments. Since surimono were not sold commercially, the print runs were very small and original Edo era surimono are incredibly rare in the market today. These fine quality suriomono reprints offer a great way to collect these classic designs at an affordable price. 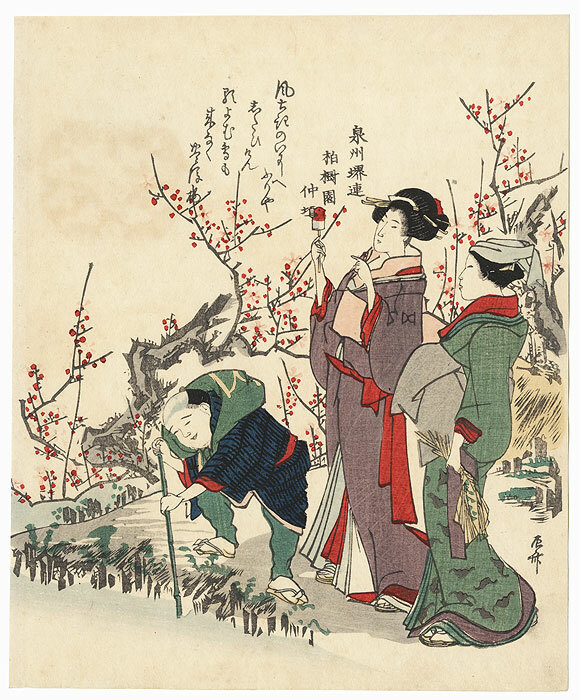 Comments - Charming surimono design of two beauties strolling beside a blossoming plum tree. 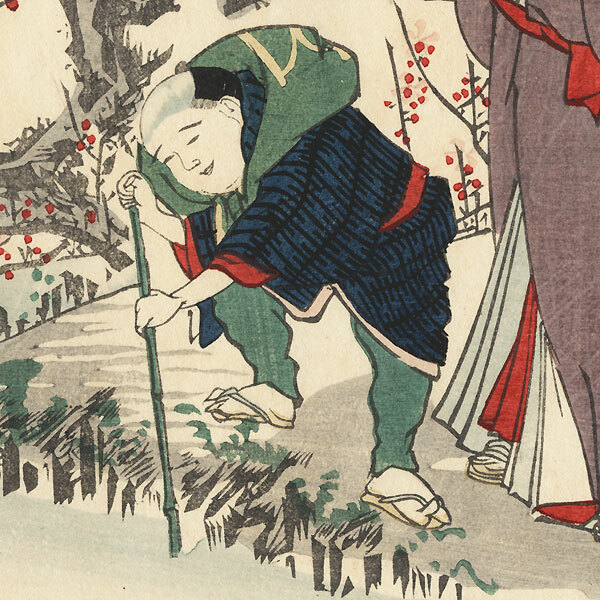 A servant accompanies them, prodding at a flowing stream with a slender bamboo pole. One of the women holds a small wooden bullfinch to be exchanged at a shrine for a new one for good luck in the New Year, a ritual known as usokae. Her companion's green robe is patterned with bats in flight. Nicely detailed. An attractive subject. Image Size - 8 1/2" x 7"
Condition - This print with good color and detail as shown. Paper remnant on reverse at right edge from previous mounting. Slight toning. Some prints have slight soiling, a few creases, or a few spots. Please see photos for details. Generally in good condition overall.